I am an incoming first generation college student who worries for the future, not only my own, but the future of others as well. For the benefit of the majority, it would be remarkable if you would establish communication among citizens and all the branches of government without the need to conceal anything. I would like you to be an efficient president who keeps his/her word, regarding the promises that you made during the election process. The promises that you advocate for on propaganda and the media affect the way in which the results turn out, so you benefit from us as well as we benefit from you. In order to have a functional and symbiotic relationship between the government and the people within it, the concerns of all the US citizens should be addressed. Their concerns should be addressed, since it is their country and they have the right to know what is going on with it. There should be no conspiracies or hidden information from the people, as the government claims to be a democracy where the power resides with the people. This is an important subject, as the government is given the power that it holds, therefore that power should not abused. Power can be abused by the government, as the surveillance placed on Americans is overwhelming and privacy invading. The power that the government is given, is often earned with respect and sometimes gained because of fear. As past political leaders in different areas of the world only had power in consequence of the fear of the people, for instance Adolf Hitler in Germany. In order for the government to prosper the power that it claims to hold, it has to keep the population within the country content, and informed on every situation. There has to be trust between the relationship, in order for it to forbid the whole system from crumbling down. 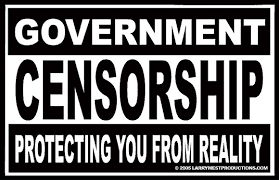 There are theories of some delicate information that the government hides from the people, for instance they manipulate the media so that the American population only knows what they want them to know. The government often hides behind the media, essentially thinking for them and making opinions for them, by strategically informing them of only certain pieces of a puzzle. The government does not only control the media, they also have control of one’s private conversations via cellphones and computers. According to the New York Times, the National Security Agency gathers messages and emails that cross the United States Border, so how can a government that spies on everyone be trusted? There is a fine line between protecting the citizens of the country and invading one of the only things that they are entitled to, privacy. This is a very important issue to me, as everyone should be entitled to having communication with others, without having to worry about someone reading their personal conversations, and their personal phone calls. Having the basic human rights that everyone deserves should not be an issue, considering that communication is a personal affair. The government should let the citizens of the country have individuality, to live their life the way they desire. A step in the right direction would be to allow the people to have their privacy, unless there are suspicions of criminality. Government Relationship and Conspiracies by Martin is licensed under a Creative Commons Attribution-ShareAlike 4.0 International License. 2nextprez, Henry Galdamez, Why Private Prisons must be dealt withLetter to Future President about "Student Loan Debt"